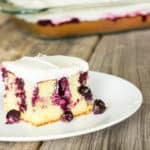 Blueberry lemon poke cake is lemon cake with holes poked in it; drizzled with lemon blueberry sauce; and topped with sweet, lemony whipped topping. 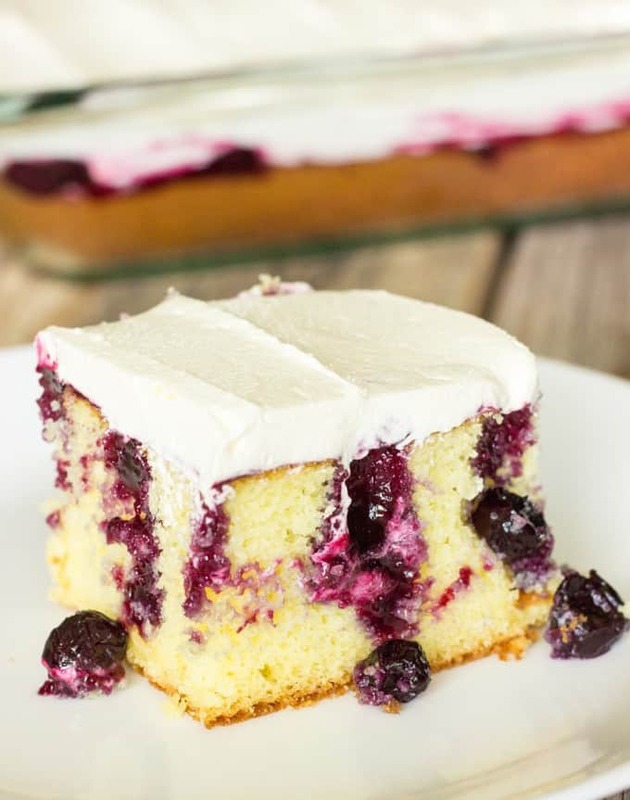 This blueberry lemon poke cake is to die for! It’s a lemon cake with holes poked in it. 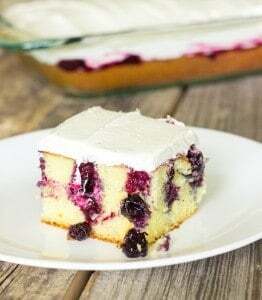 Lemon blueberry sauce is drizzled on top of the cake so that the sauce and blueberries get down into the holes. Then, it’s topped off with a frosting made of lemon curd and cool whip. Amazing! The dark blue sauce against the light yellow cake is so pretty when the cake is cut and served. This cake is fancy enough to serve at special events, but easy enough to make for any occasion. In the meantime, prepare the blueberry lemon sauce. In a medium saucepan, add blueberries, lemon zest, lemon juice, sugar, cornstarch, and salt. Stir to combine. Cook over medium heat, stirring occasionally, until the mixture starts to bubble and thicken (about 12 minutes for frozen blueberries, about 6-7 minutes for fresh). Remove from heat and stir in the vanilla. Set aside. Remove the cake from the oven and allow it to cool for 5 minutes. Use the handle of a wooden spoon to poke holes into the cake that are about an inch apart. While the cake is still warm, drizzle the blueberry lemon sauce on top. Spread the sauce into an even layer over the cake ensuring some of the sauce and blueberries get down into the holes. Let the cake cool completely (about an hour). Add the lemon curd and ½ cup of the cool whip to a medium bowl and whisk together until smooth. Add another ½ cup of the cool whip and whisk until smooth. Add the remaining cool whip to the bowl. Use a large spoon or spatula and gently fold the cool whip into the lemon curd mixture. Spread the whipped lemon topping on top of the cake into an even layer. Place the cake in the refrigerator for at least 1 hour before serving. So pretty! Might be perfect for my 4th of July party. Any suggestions to adapt this for diabetics? Cake, fruit, and (whipped) cream are all high carbohydrate foods. Reducing the amount of added sugar in the recipe will help, but it’s still going to be a high carb dish. If you would like to reduce the amount of added sugar, these are my suggestions. 1. Get a sugar free cake mix. You may not be able to find lemon sugar free cake mix. If you can’t, try a yellow sugar free cake mix and add 2 tbsp. of lemon juice to the batter before baking. 2. Use a sugar free sweetener (instead of sugar) to make the blueberry sauce. Splenda is a great substitute because it is measured the same as sugar. 3. Skip the lemon curd in the whipped topping. Instead, use 2 tsp. lemon juice and sweeten it with a sugar free sweetener to your liking. We used no sugar added pie filling instead of fresh or frozen hlueberries and skipped the sugar all together. Ive Never heard of lemon curd or any curd for that matter.exactly what is it? I looked for it at my local grocery Store and couldnt find it. How can i make it myself? lemon curd is a thick, sweet lemon spread. My local grocery stores typically have it in one of two places: in the jelly/jam section, or in the baking section next to the pie filling. can you use real whip cream instead of cooleh with the lemon curd? I prefer whipped cream over whipped topping. Did you you try it with the whipped cream? Love this recipe! We did two round pans and layered them. So good! Wish I could get a picture to attach. It turned out so pretty! Does the cake get soggy? Hi Carrie, No. The blueberry syrup is very thick and doesn’t penetrate the cake much other than right around the holes. Absolutely! It will hold up nicely for a few days when covered in the refrigerator. We have a reunion coming up. This would be the perfect dessert! Thank you. I really love this recipe but I felt like I needed a bit more topping in order to achieve something closer to what’s in the picture. I made homemade blueberry jam recently-do you think it would work? for our Sunday School Class. I can’t wait to take & see how everyone likes it. It looks so good. I love lemon cake & I love blueberries. Should be a grate combination.. I’ll post in couple days & let you know how they like it. Thank you again. Sorry about spelling. Should be a great combination. I have read para 4 over and over. I don’t understand. Thanks. Para 4 is for the frosting. You mix the lemon curd with the cool whip. Of cool whip instead of wisking it will make it fluffier. Hello Amanda Finks! My name is Amanda Finks (now Tembhurne). And thank you for the wonderful recipe! This cake was soo good. I made it for my mom, who isn’t really into sweets. It was perfect. I usually don’t like making box cakes, but the blueberry sauce and home made “frosting” added so much, you couldn’t even tell the cake was from a box. Definitely going to make this again, maybe in the spring for Easter. Not difficult or time consuming to prepare. I made this for my husband’s birthday and it was a hit! I may double the blueberry topping since it was a bit sparse. Excellent cake idea for summer potluck or BBQ. Thank you for sharing the recipe. Could I make and use real whip cream? Would it turn out the same? Thanks! Delicious cake! The flavors work great together. Will make again but double the filling. Also, I used frozen blueberries that didn’t produce a lot of liquid, so it came out very thick. Too thick to sink into the holes, which I think the cake part needs. Next time I’ll wait to add the cornstarch until I see how much liquid comes out of the blueberries and adjust the amount needed. Thanks for the recipe!